Dario Saric celebrates during the fourth quarter after making a three-pointer against the New York Knicks during the Sixers’ 108-92 win on Monday. 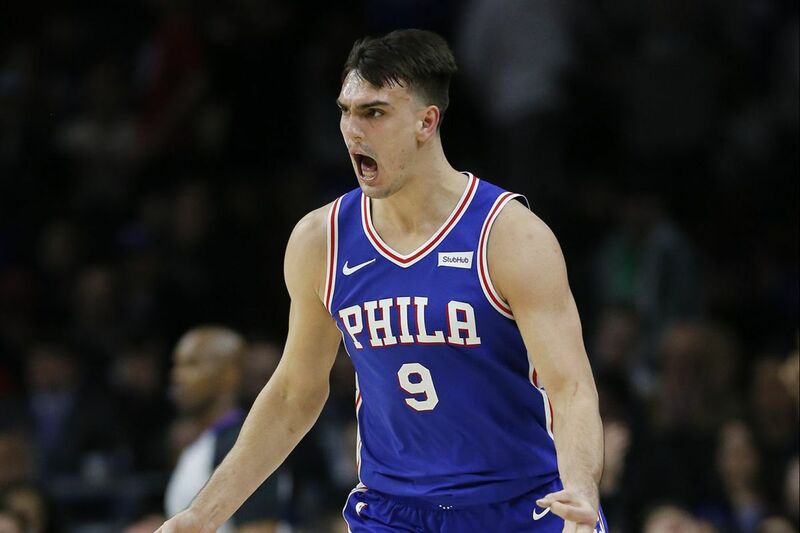 His performance was overshadowed by T.J. McConnell's triple-double, but Dario Saric had another in a series of strong recent showings in the 76ers' 108-92 win over the New York Knicks Monday at the Wells Fargo Center. Saric scored a game-high 24 points, but even more important, he kept the Sixers afloat during an uneven first half, with 16 points. The Sixers led 57-55 at halftime. For the game, Saric shot 8-for-12 from the field, including 4-of-6 from behind the three-point arc. It was the third time in the last four games that he has scored 20 or more points. He has scored in double figures in each of his last 34 games. And while McConnell's 10-point, 10-rebound, 11-assist night stole the spotlight, and rightly so, Saric's performance didn't go unnoticed by his teammates. "Nobody talks about him, he has been playing really well the past couple of games, the whole season, but the past couple of games he has been excellent," Sixers all-star center Joel Embiid said about Saric. "I think he has been our best player the past couple of games and I don't feel anybody is talking about it." "He has been amazing, shot-making, [in the] post, doing his thing, playing and his defense has been excellent," said Embiid, who had 17 points in 23 minutes, 30 seconds. "Every night he shows up and does his job and stays quiet." In the last four games, Saric is shooting 11-of-20 from three-point range. "Dario has been on a hot streak lately," said forward Robert Covington, who had 13 points and five rebounds in the win. "He has been knocking down shots, he has been playing really well and we have been finding him in a lot of different situations." Covington had an opinion similar to Embiid about Saric's recent play. "He has been playing some of the best basketball down the stretch," Covington said. Saric especially has great chemistry with Ben Simmons. On Monday, Saric was the beneficiary of some adept Simmons feeds. Simmons found Saric in a variety of ways. For instance, within about a minute's span in the first quarter, Simmons assisted on a Saric driving dunk and then found him for a three-pointer. "Everybody knows Ben is a great passer and I try to get open," Saric said. "We try to find each other, but he finds me more than I find him." The big difference for Saric in his second season has been his work from beyond the arc. As a rookie last year he shot 31.1 percent from three-point range. This year he is shooting 38.7 percent. "We are a fast-paced team and shoot a lot of threes, and if you knock down a lot of shots your confidence will skyrocket, and that is what you see with Dario," Covington said. The Sixers have won four in a row and 10 straight at the Wells Fargo Center. Saric says he feels the Sixers can be inspired by the Eagles' Super Bowl championship. "We have a talented team, Joel is an all-star, Ben is almost there and we have a bunch of guys who are ready to play good basketball," said Saric, now averaging 14.6 points per game. "I hope because of the Eagles atmosphere, we make the playoffs."